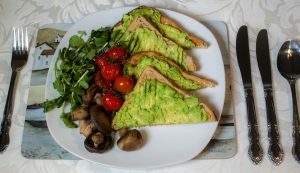 Enjoy bed and breakfast with a difference. Relax in your own private suite located on the upper floor of Fern Dene, a former Sea Mariner’s residence. At The Fern Suite you will be the only guests. Maggie Keating runs the Fern Suite full time, 24 hours a day, to ensure guests receive a complete break. All rates include housekeeping. The guest bedroom provides views up towards the medieval village of Raw, whilst the living room gives you the chance to sit back and watch the ever changing sea and landscape. Amenities provided in the living room include Freeserve TV, DVD player, Ipod speaker facility and fridge. Naturally, there is free Wifi too. The Fern Suite is a non smoking suite. Breakfast is served to guests in The Fern Suite at a time of their choosing. 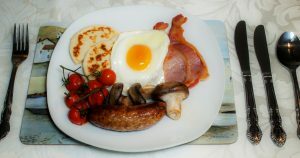 Options include a full cooked English breakfast or a range of alternatives to suit every palate. Homemade cakes, biscuits and fresh fruit are provided. Packed lunches and cream teas can also be provided on request as optional extras. 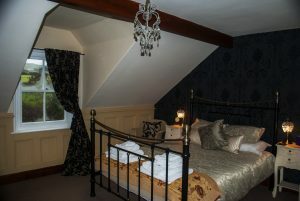 The Fern Suite is available for £135 per night for 2 people. Single room occupancy for an individual is available at £105 per night. 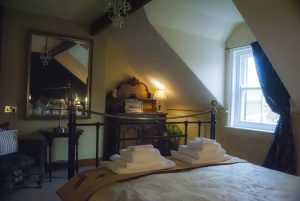 The library is also available for single occupancy at £90 per night. Please phone direct for details.